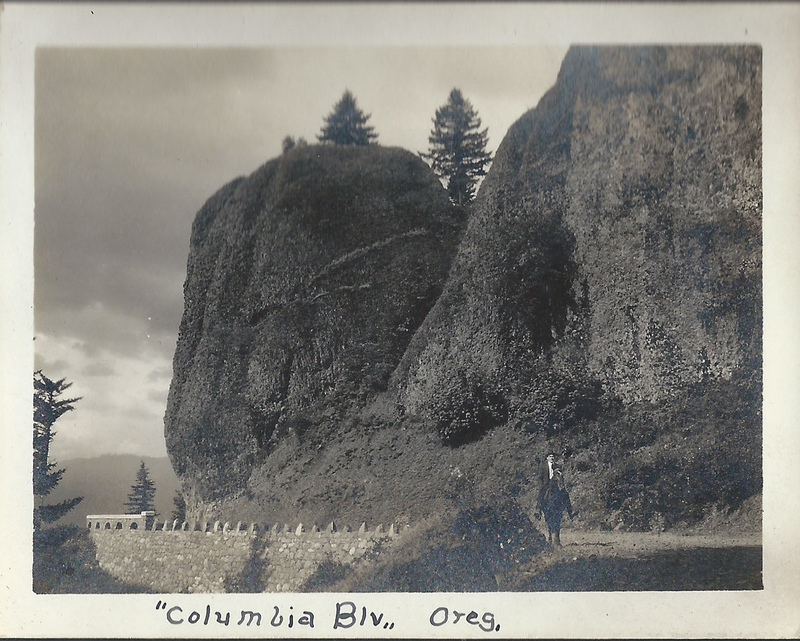 Columbia River Highway – Here’s a series of photos from 1927, ten years after the opening of the Historic Columbia River Highway, showing a young man and his Harley Davidson motorcycle. One of the photos clearly shows road signs with familiar destinations – Portland, Sandy, Bull Run, Gresham, Troutdale and the Columbia River Highway. 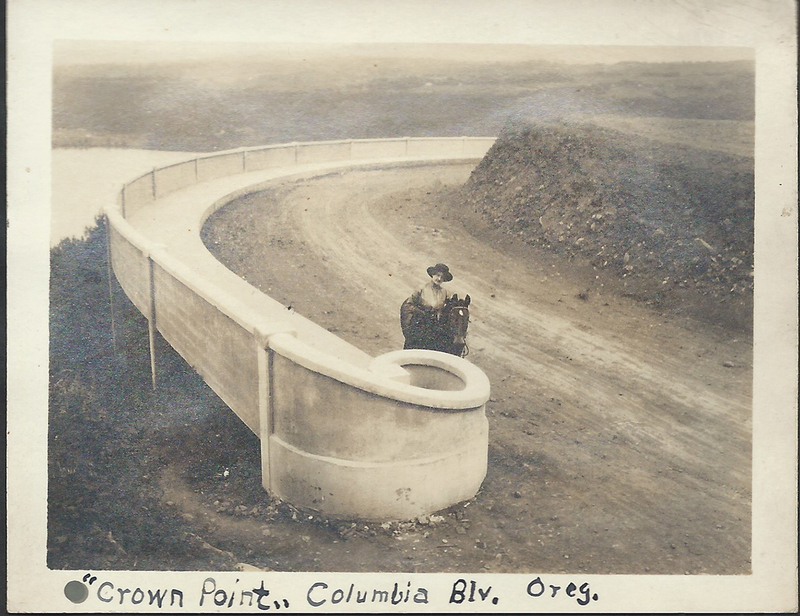 The best part of the photo is the additional temporary sign that reads “Columbia River Highway Closed To Through Traffic” placed in on top of one of the road’s stone and concrete guard rails. The second one shows some stone rubble along a roadway which looks much like a winter day at unstable spots along the old road today. The Summit of Mt. Hood circa 1915 – This is a “Magic Lantern” slide from my collection. It shows a climber standing on the top of Mount Hood with the old Summit House fire lookout station built by the legendary mountain man Lige Coalman. All of the lumber was carried up the mountain by hand, with Lige doing most of the carrying. Lige found it difficult to find men who would work as hard as him. Most of those whom he hired lasted only a day or two before quitting. Once the building was built Lige routinely carried barrels of heating oil and other supplies to the lookout. This structure was built in the Summer of 1915. By 1941 it had deteriorated to bad that it was pushed over the edge. 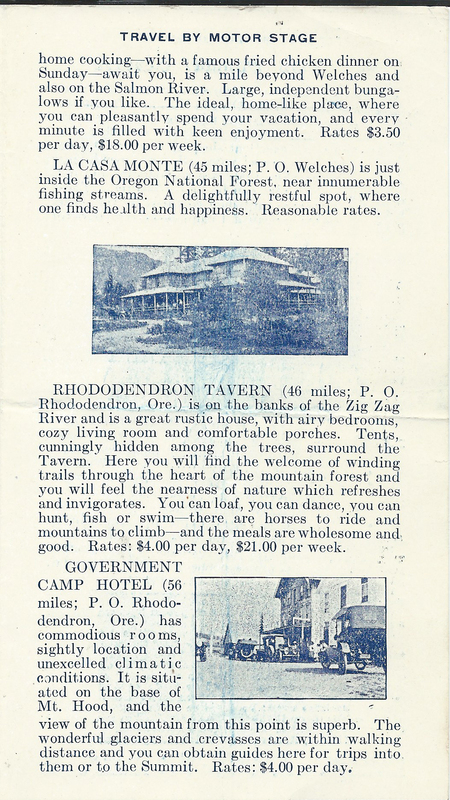 It was 1915 and a lot was going on just east of Troutdale Oregon in the beautiful Columbia River Gorge. The Columbia River Gorge back then had only limited ways of accessing it. Traditionally excursions from Portland on steam powered sternwheeler paddle boats were the way that most transportation took place. In time the railroads were built, primarily for trade but in time passenger trains started taking people there on day trips. Tourist excursions to the waterfalls on the south side of the river were common. 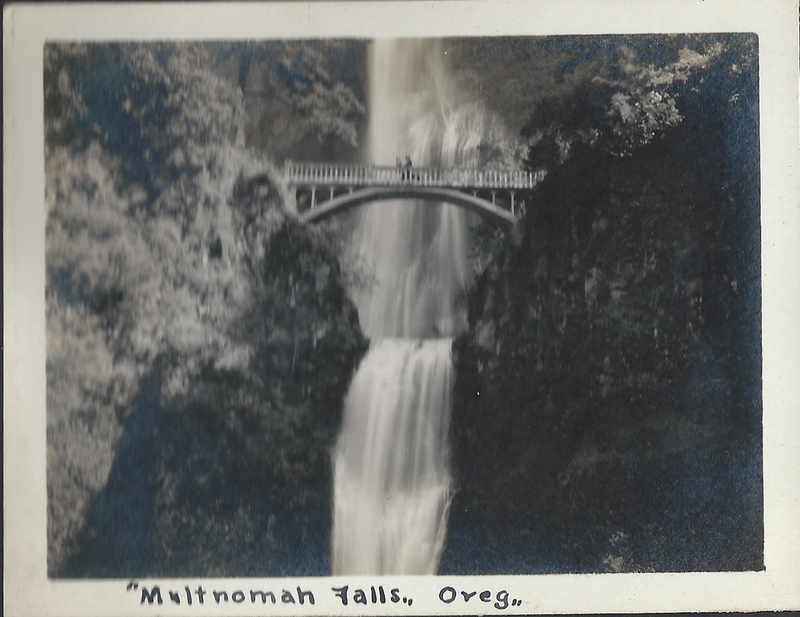 Locations such as Multnomah Falls were the main attractions. Of course many people rode horses or travelled in horse drawn wagons back then but with the advent of automobiles the old primitive roads were improved and new roads were made but they were still dirt wagon roads. Not long after the idea to create one of the first paved scenic automobile roads in America was imagined by several prominent Portland businessmen. 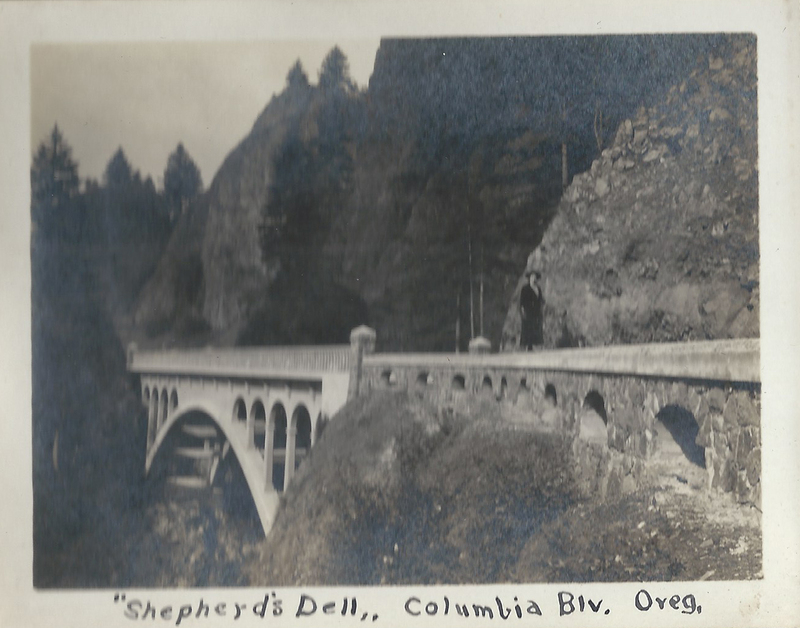 Thus was created the Scenic Columbia River Highway. Although a cultural treasure today, not all who lived in the area back then supported this idea. Many people still used horses and automobiles were owned by the wealthy. 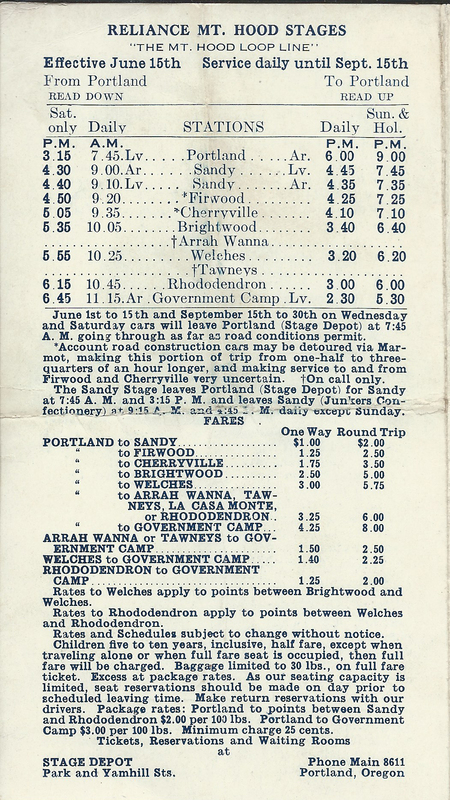 Many people back then never thought that they would ever own a car let alone use one to tour the Columbia River Gorge. Public support for financing the highway was tenuous at best. As we all know, the highway was built and within a couple of decades was being used heavily for transporting cars from central Oregon to the Willamette Valley. Heavy trucks had been developed to carry commodities and products and most everyone had a car in their garage. It didn’t take long to see how those who imagined the highway were visionaries. The highway was quickly becoming overused and plans for a riverside highway, which would become Highway 84, was in the works. 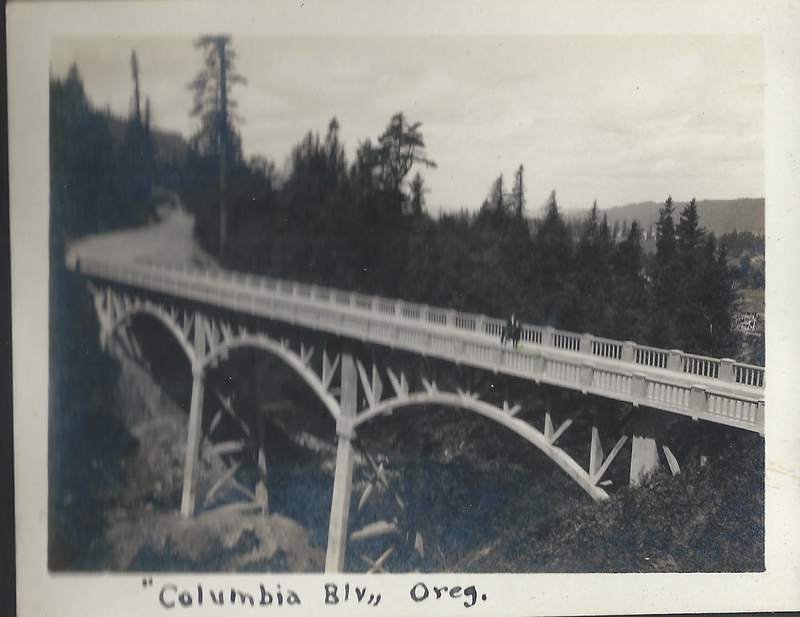 And so back in 1915 the Columbia River Highway was in construction. It would be dedicated a couple years later in 1917, but that didn’t keep people from going out to explore the modern engineering marvel. Of course traffic was minimal back then. Today we can only imagine a peaceful horseback ride along it’s path to familiar waterfalls along the way, but that’s just what this couple did. Cal and Grace Calvert decided to take a trip out to survey the progress on the old highway via horseback. Cal Calvert was a photographer from Portland Oregon. He was known as the Ten Minute Photo Man. He operated his Mazeograph Studio in downtown Portland as well as a studio at Council Crest, a popular amusement park of the day. These photos are some of his personal photos. Snapshots into his and his wife Grace’s life. 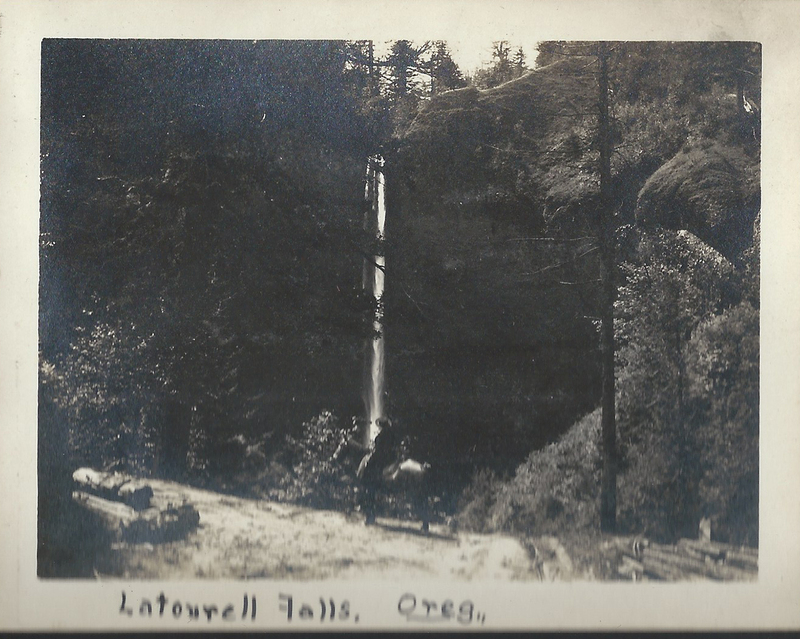 In these photos you can see familiar places such as Crown Point, Latourell including the falls and the old arched footbridge that was removed due to obstruction of trucks that needed to pass as well as the recently constructed highway bridge. 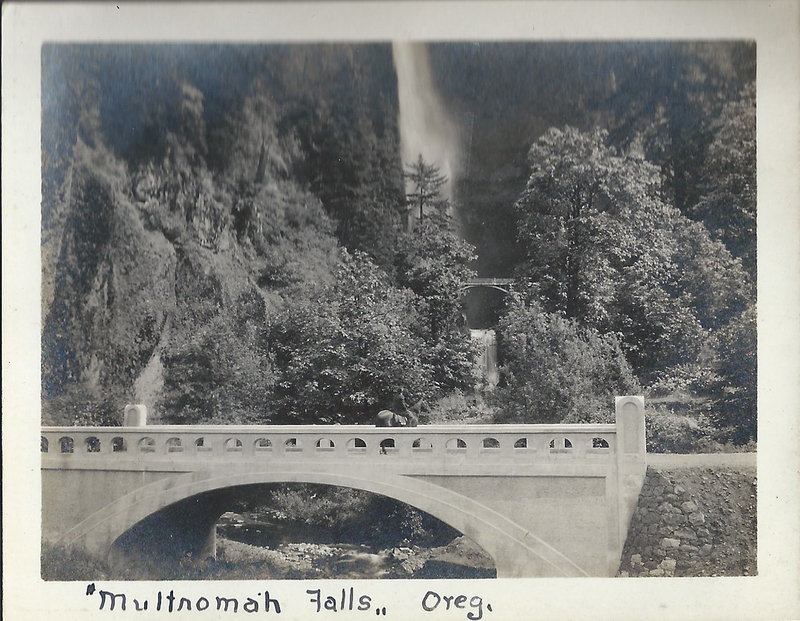 Other locations include Bishops Cap and the Sheppards Dell Bridge, as well as Multnomah Falls. Grace and Cal take turns posing in the photos with their horse, including one where one of them made their way to the Simon Benson bridge between the upper and lower tier of Multnomah Falls. 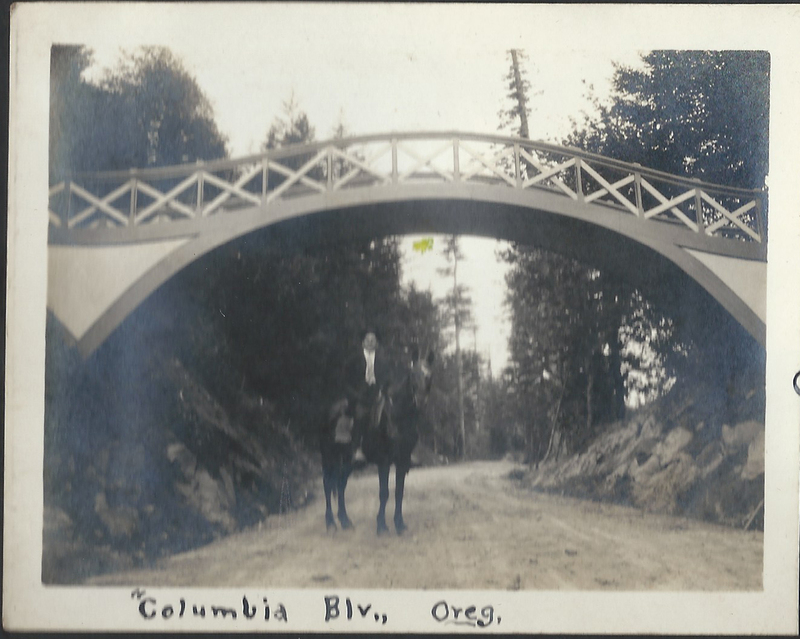 Needless to say a horse ride on the old Historic Columbia River Highway is totally impractical today, but there once was a time. I’m certainly glad that Cal and Grace took the time to document their day in the Scenic Columbia River Gorge. 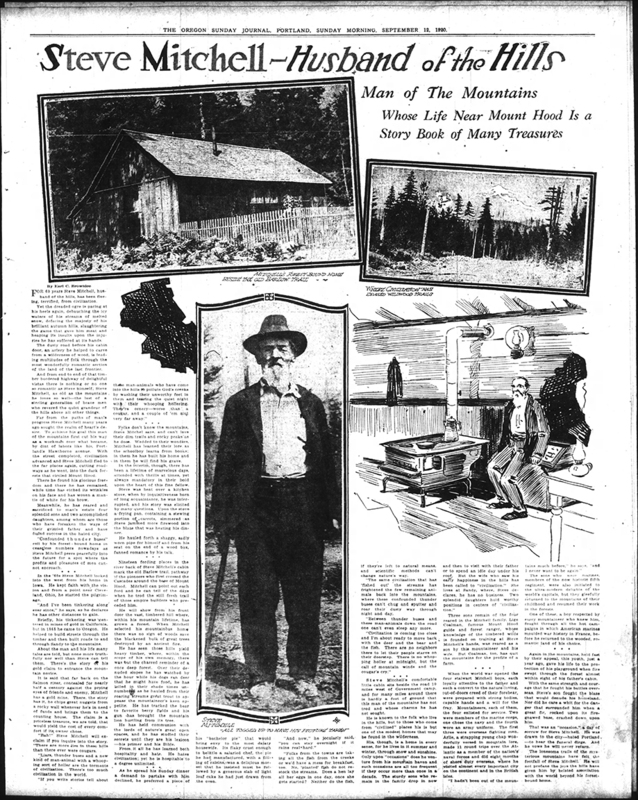 Steven Mitchell was legend on Mount Hood in his times, as well as his son Arlie, who was the last tollgate keeper at the Rhododendron Tollgate of the old Barlow Trail Road. Lige Coalman, who was raised by Steven, was also a legendary mountain man on Mount Hood in his own right. For 60 years Steve Mitchell, husband of the hills, has been fleeing, terrified, from civilization. Yet the dreaded ogre as pacing at his heels again, debauching the icy waters of his streams of melted snow, defacing the majesty of his brilliant autumn hills, slaughtering the game that gave him his meat and heaping its insults upon injuries suffered at its hands. The dusty road before his cabin door, an artery that helped to carve from the wilderness of woods, is leading multitudes of folk through the most wonderfully romantic section of the land of the last frontier. And from end to end of the timber bordered highway of delightful vistas there is nothing or no one so romantic as Steve himself; Steve Mitchell, as old as the mountains he loves so well-the last of a sterling generation of brave men who revered the quiet grandeur of the hills above all other things. Far from the paths of man’s progress Steve Mitchell many years ago sought the realm of heart’s desire. To achieve his goal this man of the mountains first cut his way as a workman over what became, by dint of labors like his, Portland’s Hawthorne avenue. With the street completed, civilization advanced and Steve Mitchell fled to far places again, cutting roadways as he went, into dark forests the circled Mount Hood. There he found his glorious freedom and there he has remained, while time has etched its wrinkles on his face and has woven a mantle of white for his brow. Meanwhile, he has reared and sacrificed to man’s estate four splendid sons and two accomplished daughters, among whom are those who have forsaken the ways of their grizzled father and have found success in the hated city. “Confounded thunder buses” roll by his forest-bound home in ceaseless numbers nowadays as Steve Mitchell peers peacefully into the future for a spot where the profits and pleasures of men cannot be encroached. In the ‘60s Steve Mitchell looked into the west from his home in Iowa. He kept faith with the vision and from a point near Cleveland, Ohio, he started the pilgrimage. “And I’ve been tinkering aling ever since,” he says, as he declares he has other distances to gain. Briefly, his tinkering was centered in mines of gold in California, but in 1866 he came to Oregon. He helped build streets through the timber and then built roads to and through Sandy to the mountains. About the man and his life many tales are told, but none more truthfully nor well then Steve can tell them. There’s the story of his gold claim to entrance the mountain novice. It is said that far back on the Salmon River, concealed for nearly half a century against the prying eyes of friends and enemy, Mitchell has a gold mine.. There, the story has it, he chips great nuggets from a rocky wall whenever he’s in need of funds and brings them to the counting house. The claim is a priceless treasure, we are told, that would yield the cost of every comfort if its owner chose. “Bah!” Steve Mitchell will exclaim if you inquire into the story. “There are more lies in these hills than there wever were cougars. “Liars, thunder buses and a new kind of man-animal with a whooping sort of holler are the torments of civilization. There’s too much civilization in the world. Folks don’t know the mountains, Steve Mitchell says, and can’t love their dim trails and rocky peaks as he does. Wedded to their wonders, Mitchell has learned their lore as the schoolboy learns from books; in them he has built his home and in them he will find his grave. In the interim, though, there has been a lifetime of marvelous days, attended with thrills at times, yet always mandatory in their hold upon the heart of this fine fellow. Steve was bent over a kitchen stove, when by inquisitiveness born of long acquaintance, he was interrupted, and his story elicited by many questions. Upon the stove a frying pan, containing a stewing portion of carrots, simmered as Steve jammed more firewood into the blaze that was heating his dinner. He hauled forth a shaggy, yet sadly worn pipe for himself and from his seat on the end of a wood box, fanned romance by his talk. Nineteen fording places in the river back of Steve Mitchell’s cabin mark the old Barlow trail, pathway of the pioneers who first crossed the Cascades around the base of Mount Hood. Mitchell can point out each ford and can tell of the days when he trod the still fresh trail of those empire builders who preceded him. He will show from his front door the vast, timbered hill where, within his mountain lifetime, has grown a forest. When Mitchell selected his mountainous home there was no sign of woods save the blackened bulk of great trees destroyed by an ancient fire. He has seen those hills yield heavy timber, where, within the scope of his own memory, there was but a charred reminder of a once deep forest. Over their denuded slopes he has watched by the hour while his dogs ran deer that he might have food, he lolled in their shade times unnumbered as he hauled from their roaring streams great trout to appease the mountaineer’s keen appetite. He has tracked the bear to favorite berry fields and his gun has brought the mountain lion hurtling from his tree. He has held communion with the lords of nature’s great open spaces, and he has studies their secrets until they are his lexicon-his primer and his Bible. From it all he has learned both hospitality and hate. He hates civilization; yet he is hospitable to a degree unlimited. As he spread his Sunday dinner a demand to partake with him declined, he proferred (sic) a piece of his “bachelor pie” that would bring envy to the most dainty housewife. Its flaky crust enough to belittle a salaried chef, the pie he had manufactured, with filling of raisins, was a delicious morsel the he insisted must be followed by a generous slab of light loaf cake he had just drawn from the oven. “Folks from the towns are taking all the fish from the creeks are we’d have a mess for breakfast too. No, ‘planted’ fish do not restock the streams. Does a hen lay all her eggs in one day, once she gets started? Neither do fish, if they’re left to their natural means, and scientific methods can’t change nature’s way. “The same civilization that has ‘fished out’ the streams has frightened the few remaining animals back into the mountains, where these confounded thunder buses can’t chug and sputter and roar their dusty way through night and day. “Between thunder buses and these man-animals down the road one can’t even sleep anymore. Steve Mitchell’s comfortable little cabin sits beside the road 10 miles west of Government camp, and for many miles around there is hardly a foot of ground that this main of the mountains has not trod and whose charms he has not sought. He is known to the folk who live in the hills, but to those who come from “civilized” places his is but one of the modest homes that may be found in the wilderness. His, though, is a home in every sense, for he lives in it in summer and winter, through snow and sunshine. Only upon “occasions” does he venture from his mountain haven and such occasions are all to frequent if they occur more than once in a decade. The sturdy sons who remain in the family drop in now and then to visit with their father or to spend an idle day under his roof. But his wife who saw his early happiness in the hills has been called to “civilization.” She lives at Sandy, where, Steve declares, he has no business. Two splendid daughters hold worthy positions in centers of “civilization”. Three sons remain of the four reared in the Mitchell family. 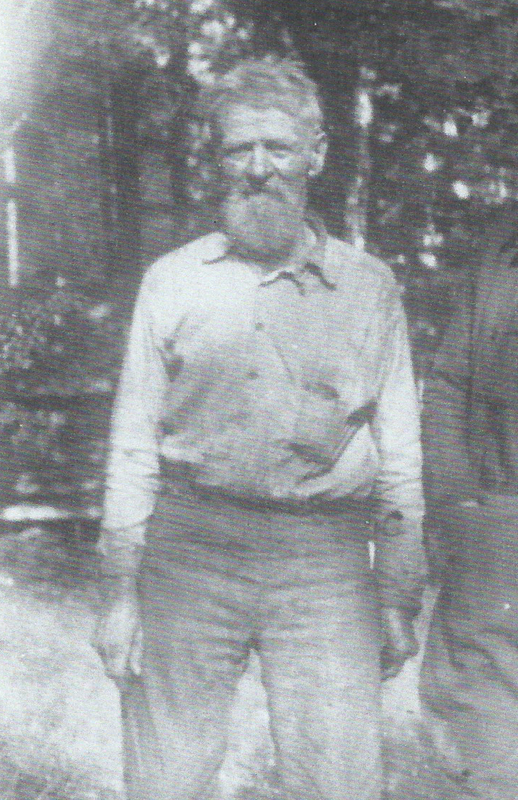 Lige Coalman, famous Mount Hood guide and forest ranger, whose knowledge of the timbered wilds founded on training at Steve Mitchell’s hands, was reared as a son by this mountaineer and his wife. But Coalman, too, has quit the mountains for the profits of a farm. When the world war opened the four stalwart Mitchell boys, each loyally attentive to their father and each a convert to the nature-loving, out-of-doors creed of their forebear, were prepared with strong bodies, capable hands and a will for the fray. Mountaineers, each of them, the four enlisted for service. Two were members of the marine corp, one chose navy and the fourth wore an army uniform. The first three were overseas fighting men. Arlie, a strapping young chap wonderfully versed in mountain lore, made 11 round trips over the Atlantic as a member of the nation’s naval forces and did eight months of shore duty overseas, where he visited almost every important city on the continent and in the British Isles. “I hadn’t been out of the mountains much before,” he says, “and I never want to be again. The sons who were marines, members of the mow historic fifth regiment, were also initiated to the ultra-modern delights of the world’s capitals, but they gleefully returned to the mountains of their childhood and resumed to their work in the forests. One of these, a boy respected by every mountaineer who met him, fought through all the hot campaigns in which the American marines mouled war history in France, before he returned to the wooded, romantic land of his choice. Again in the mountains, held fast by their appeal, this youth, just a year ago, gave his life to the protection of his playground when fire swept through the forest almost within sight of his father’s cabin. With the same strength and courage that he fought his battle overseas, Steve’s son fought the blaze that would denude his homeland. Nor did he care a whit for the danger that surrounded him when a great fir, rocked upon its fire gnawed base, crashed down upon him. That was an “occasion,” a day of sorrow for Steve Mitchell. He was drawn to the city-hated Portland-to hear the funeral dirge. And he vows he will never return. I have spent a lot of time talking with old timers and family members of those who have lived up here in the Mountain Community for quite a few years now. In one or two conversations I’ve heard tell of a woman who gained local notoriety for killing a bear that invaded her space with a garden hoe. That’s right a woman killed a bear with a hoe. This afternoon while perusing newspaper archives I happened across this newspaper clipping. Well what do you know? It’s a true story. This is Chief Tommy Thompson. I don’t hear his name mentioned much these days. When my father was a boy growing up in The Dalles he was legend. He would come to the schools and give talks to the children about the local native history and heritage. He was a man who was respected by all races. “Chief Tommy Thompson was a most exceptional human being, a cross between Jim Thorpe and the Pope. Tall, handsome, and athletic, a famed swimmer and boatman in his youth, he was married to as many as seven women at one time but never to a white woman; it would have been unthinkable. Chief Tommy Thompson was a holy man. His ancient religion was that of the Waashat, the drums. He had begun serving as salmon chief at Celilo Village in 1875, when he was but twenty, after the death of the previous chief, his uncle Stocketly, who had been killed by friendly fire while serving as a scout for the U.S. Army. Tommy was salmon chief of Celilo Falls for the next eighty-five years, making him, without much question, the longest-serving public official in American history. Chief Tommy Thompson was also the most revered man on the river, the last true chief. This is a unique set of postal cards that were made by the family using the photos that they made that day. It was quite common back in the early part of the 20th Century to have your photos printed on postcard stock. You could then send the cards off to friends and relatives across the country. In the group photo a camera is clearly seen in the left hand of the gentleman on the right. Most likely an early Kodak. 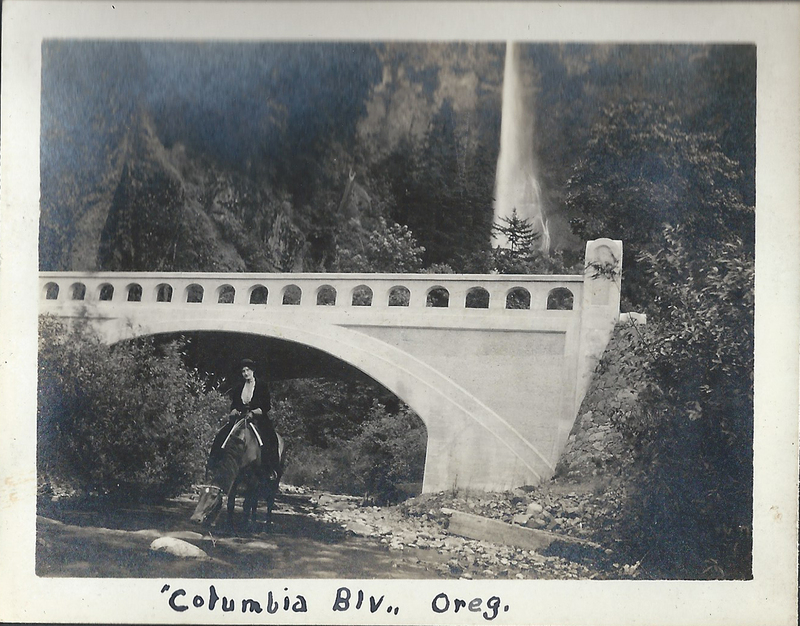 Although we don’t know how the folks in the photos area, I’m sure that their “Trip up The Columbia Highway” was very similar to a day on the Historic Columbia River Highway in today’s Columbia River Gorge. A Trip up The Columbia Highway, Portland, Ore.
Cross and Dimmit Postcards of The Columbia River Gorge and Historic Columbia River Highway. 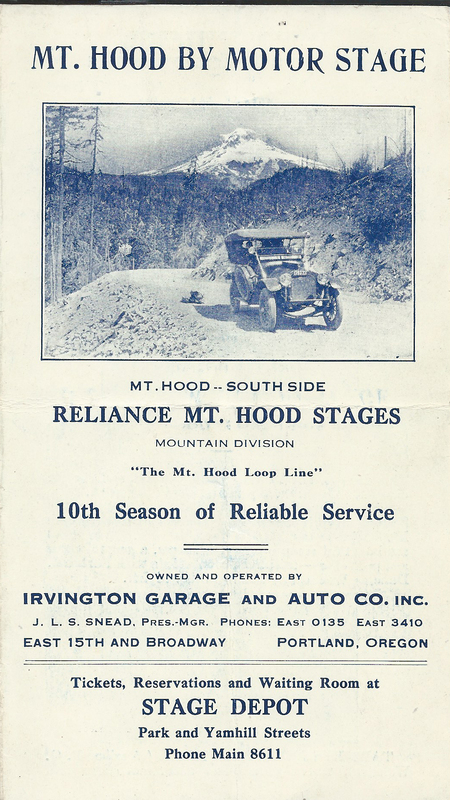 Reliance Mt Hood Stages – In the early days of the road to Mount Hood, after the immigrant era, the road allowed the burgeoning new city of Portland to access the mountain for recreation. Mountain climbing and hiking the trails in the foothills in those days was the primary activity in the area. Skiing had yet to become an activity on the mountain. Automobiles were starting to become a practical means of transportation, but was still primitive. 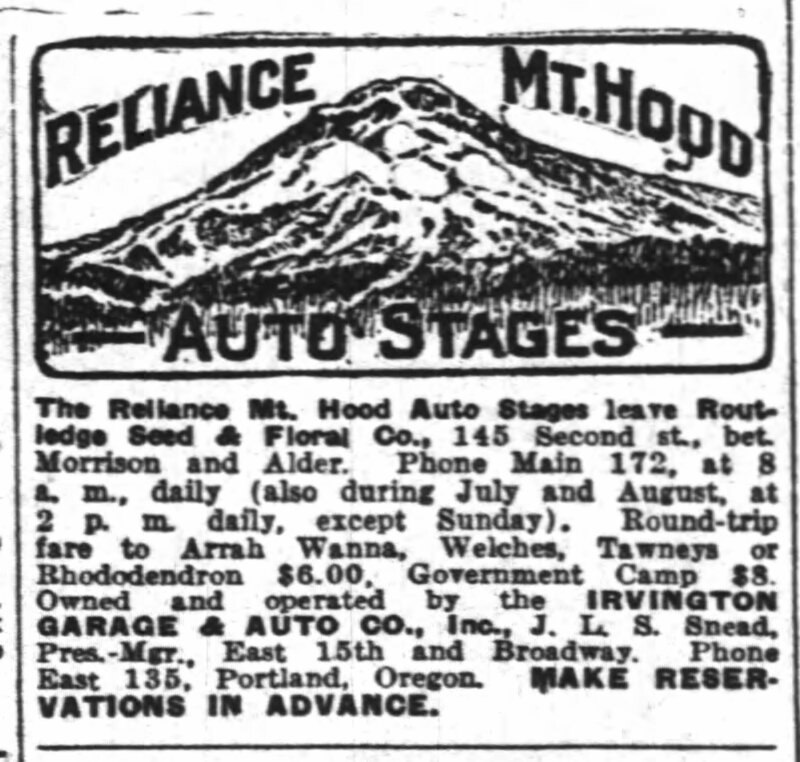 Most people didn’t own a car which gave stage companies an opportunity to carry fun seekers to and from the lodges and roadhouses on Mount Hood. This also gave inn keepers an opportunity to host these people because a trip to Mount Hood wasn’t a simple day trip. Many times a trip to Mount Hood was a week minimum investment in time. 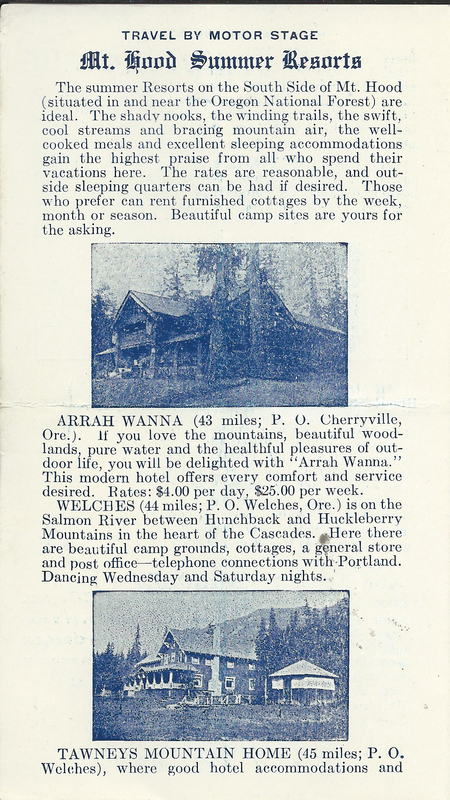 Lodges such as Arrah Wanna, Welches Ranch, Tawney’s Mountain Home, La Casa Monte, The Rhododendron Tavern and the Government Camp Hotel all sprang up due to a need to recreational lodging. The flyer below gives a great representation of the mileage, the lodging available and cost of a trip to the mountain. Those days were primitive and simple and difficult compared to this day and age, but the life that was lived seems much more fun and adventure filled than the way we live today. Irvington Garage and Auto Co. Inc.